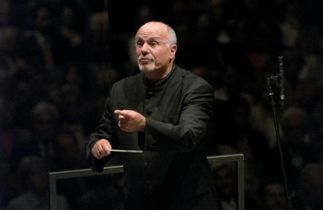 Guest conductor David Zinman took over the reins of the Orchestre symphonique de Montréal (OSM) this week to conduct two monumental works—Beethoven’s Emperor Piano Concerto and Richard Strauss’ Also sprach Zarathustra. The Strauss performance was sensational. Composed in 1895-96, this tone poem of nine sections is Strauss’ commentary on the nine chapters of Nietzsche’s philosophical novel of the same title on the idea of the Superman. Played without pause, each part attempts to illustrate different aspects of the confrontation between Nature, introduced in the first section by a motif first heard by the trumpets; and Mankind, heard low down on the pizzicato cellos and basses after the clamour has faded away. Zinman and the massive, augmented forces of the OSM rendered a thrilling opening (“Sunrise”) with a solid, progressive crescendo culminating in an earth-shattering climax—absolutely spine-tingling. Burnished brass and singing strings provided an ethereal touch to the conclusion of the section. Zinman brought a lyrical glow to the next part (“Von den Hinterweltlern”) and a lovely hushed sound to the basses in the third. The trombones played the “Disgust” motif with a smooth, honeyed tone in “Joys and Passions”, and the strings glistened in the darkly-orchestrated “The Song of the Grave”. The ironic rhythms of the “Dance” were aptly realized with the help of the pulsating solo playing from concertmaster Andrew Wan. There was also flawless work from solo trumpet Paul Merkelo and an impressive, unified sound from the trombones throughout the work. Maestro Zinman, sitting in a chair before the score, maintained tight control over the orchestra, shaping and bringing out the myriad colors of each section, without giving way to gratuitous theatrics or sentimentality The sound from the organ in the loft high above the stage was barely audible, however, from where I was sitting near the rear of the first balcony. But all in all a tremendous performance. Beethoven’s Emperor Piano Concerto with soloist Stephen Hough didn’t fare as well. (The sobriquet is attributed to the composer and piano-maker J. B. Cramer, who may have called it the “emperor among concertos”.) It is certainly heroic in scale (Napoleon’s troops were knocking on the doors of Vienna when it was being composed in 1809), and represents the epitome of concerto development through Mozart up to this point. Its influence was to be felt throughout the rest of the century. The performance, however, was anything but heroic. Hough played with fine articulation and technique, and a clear, singing tone, but overall was too graceful and Classical in his approach. My guest said that the performance sounded like “salon music”. Hough could have been forgiven if he had been playing Beethoven’s first or second concerto, but this, the “emperor of concertos” deserved more passion, drive and vision. The most profound movement, the Adagio, was limp, shapeless and without color and depth. The bridge between this and the concluding Rondo was dragged out to the breaking point. The sound from orchestra accompaniment was muddy and flat. It was hard to believe that this was the same orchestra that excelled in the Strauss. Are the OSM concerts becoming shorter in length? This one provided one hour and eleven minutes of music; last week’s one hour and nine minutes!